Getting a cup of coffee right can make or break your day, whether it's your first cup in the morning that you drink in your car on the way to work, your pick-me-up at 10 a.m. or your cup to linger over on Sunday morning. 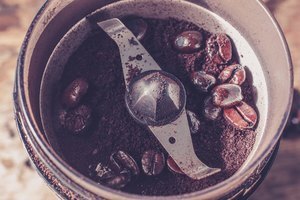 General rules apply to the ratio of beans to ground coffee, but conduct some experiments on your own too until you find the exact ratio of beans to grounds to water that work best for you. Post your results on your fridge or bulletin board so that you can brew your coffee in the same way every time. James Hayes-Bohanan, barista and affiliated scholar at the Vanderbilt University Institute for Coffee Studies, claims that when measuring coffee, "too much is better than too little." Add extra hot water if your cup comes out too strong. Because coffee beans differ in their flavor and strength, the Stumptown Coffee Roasters website recommends that you measure your beans by weight once you find a ratio that works for you. It suggests 21 grams of beans for each 8-ounce cup of coffee. You may find that measuring by the cup or tablespoon of coffee beans is easier than placing the beans on a scale, but your coffee-brewing results will vary. Stumptown testers measured 3 tablespoons of coffee beans and got five different weights, ranging from 16.9 to 25.8 ounces. Meister, a writer at Counter Culture Coffee and columnist for Serious Eats, got the same variations, measuring 4 tablespoons of beans and ending up with finely ground coffee weighing 39.3 grams and coarsely ground coffee weighing 38.5 grams. When you measure coffee beans by weight, coffee grounds weigh the same amount as beans -- 21 grams of beans results in 21 grams of ground coffee even though its volume will change. However, since tablespoon measurements of beans vary, 1 tablespoon of beans does not yield 1 tablespoon of grounds. 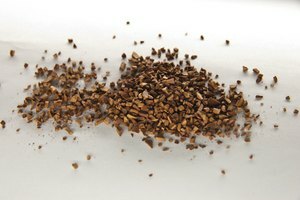 The inconsistency of converting beans to grounds when you use a cup or tablespoon may not be that significant if you aren't overly fussy about your coffee. You may not be able to taste the difference of a few grams from one batch of coffee to another. Find a measuring system that works for you and strive for consistency in terms of the ratio of coffee grounds to water instead of focusing on the ratio of coffee beans to grounds. What's most important is finding your own level of consistency. The National Coffee Association USA recommends that you brew coffee with 1 to 2 tablespoons of ground coffee for each 6 ounces of water in a drip coffee maker. Use a bit more coffee for a stronger brew. 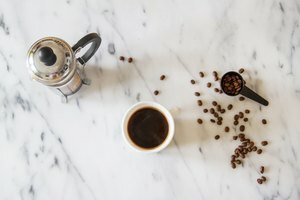 French press coffee pots generally take 2 tablespoons of grounds for a 9-ounce cup of coffee, because they need a coarser grind than drip coffee makers. Measure the beans in the same way you would for making coffee by a drip system.